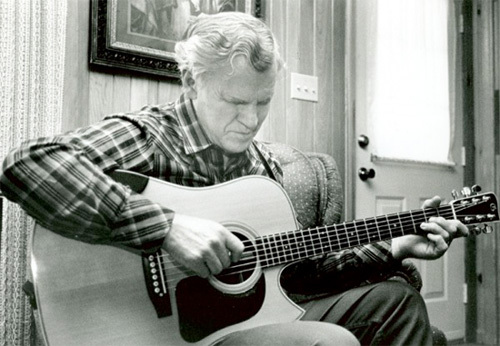 Skip Matheny— currently a songwriter in the band Roman Candle and former bartender in a retirement community — was recently able to ask music legend Doc Watson some questions with David Holt. 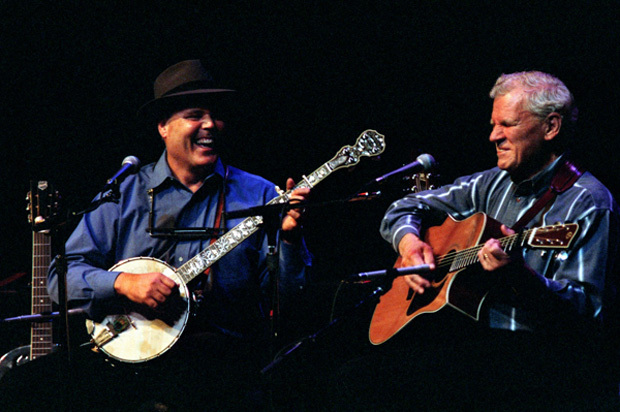 Doc and David won the 2002 Grammy Award for Best Traditional Folk Album, with their three-disc set, Legacy. Commonly called a “National Treasure,” Doc is currently 89 years old and playing this weekend at the Merlefest in Wilkesboro, North Carolina, along with Vince Gill and others. Skip’s Note: As long as we have been doing ‘Drinks With’ interviews I have wanted to ask Doc Watson some questions for this series. 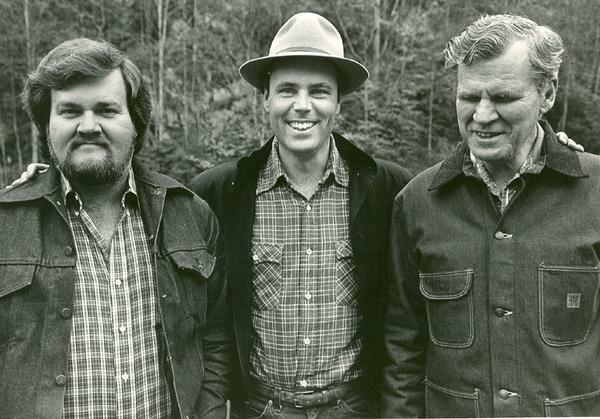 But considering Doc officially stopped doing interviews years ago, and he doesn’t drink alcohol (Merlefest has been a dry festival since it began in 1988), odds were slim. However through the generosity of Doc’s long time musical collaborator David Holt, we successfully managed this interview. David asked Doc my questions for me, and being an old friend to Doc, was able to inspire answers I’m sure I never could have. I am very grateful to both Doc and David that we can publish this conversation below. Doc who are some of the lyricist you admire? Songwriters that write good words, maybe now or over the years? I know you like Jimmie Rogers. Jimmy Rogers was the first man that I started to claim as my favorite. And Riley Puckett wrote some fun songs that I liked. He used to sing, I don’t know if he wrote it or not, “Old Dan Tucker.” I liked that song (laughs) And then there was Hank Williams. “Deep River Blues” is certainly another one that you helped perpetuate. That’s the Delmore Brothers, but I probably added some notions to some of the words on that one. You are a good song re-writer. Take a song like “Fishin’ Blues,” which is a great old song that Henry Thomas recorded in the 1920s and the words didn’t make much sense and you re-wrote them to make more sense out of the song. Well I’d been fishing a few times with some of the boys [when I was young] and I’d sit and think about how it would be like if I could see, and throw a line and catch a big catfish or something and bring him to the bank. So you really picture the song and what would happen and try to write words based on that ? I know you did the same thing with ‘Rise When The Rooster Crows.’ You took Uncle Dave Macon’s song and really made it more of story — and one time you told me the whole story of what that guy was. He was up north and thinking about coming down south, coming back home. Tell me how you do it. You just imagine being in the place of the man that’s away from home and you’re going to get up early to catch that train that’s going to take you there. I thought about that. My Uncle Glen caused me to love freight trains and passenger trains more than anybody in the world when he was here living. He was one of my favorite uncles, maybe my very favorite. He wasn’t a preacher or nothing like that, he was just a good guy. And he had a flaw or two in his thinking. To love him, like a boy would, when I was a young’un I heard him tell hobo stories about how he used to hobo the trains when he was young and got big enough to leave home and go on some adventures. And that made me love trains. Every time I would hear one when I was going to school, Uncle Glen was on that thing. Not that one I didn’t make up. I heard Elizabeth [Cotten] sing that. Oh … it’s not on any of her records is it? No it’s not. I heard her sing it and remembered it. She was the kind of person who, if you got to know her, you didn’t forget her. And what she sang, it just claimed a little corner in your thinking and stayed there. There are really quite a few traditional songs that you have helped stay alive. Even some more modern things like “Three Times Seven” by Merle Travis. Not many people even know that Merle recorded that, and you only recorded it once, but people like me have learned it from you. One of the reasons I recorded Merle Travis’s song, I admired him as a singer and a guitar player. He was a coal miner’s son. He’s really a country boy at heart but he learned a lot of music that wasn’t country music. Did you ever get to play music with him? 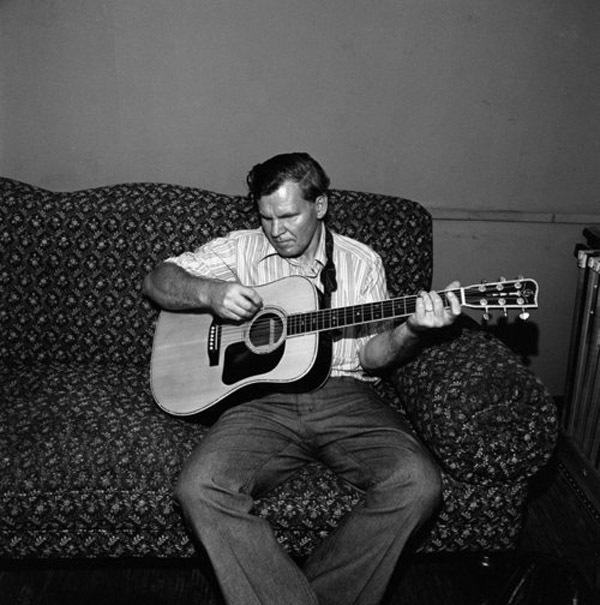 At Winfield, Kansas he [Merle Travis] said, “Doc Watson, how would you like to come up on stage and play a set of music with me?” I said, “You know something? I’ve been one of your fans ever since the first time I heard you. I’d just about give one of my eye-teeth to get to do that. And those recordings are on the Vanguard series and that’s one of the finest versions of “I Am A Pilgrim” that has ever been recorded. What are some the songs you learned from your father-in-law Gaither Carlton? Your music has always meant a lot to listeners of different ages and generations. Are there any songs that you have thought about learning from younger artists say in the last 30 years or so? And you do “Nights in White Satin” too. I don’t remember who wrote that but I know who recorded it and I learned it from that record. Pernell Roberts. He recorded it and I learned it from his record. And I did put it on Vanguard. Which songwriters do you think know how to tell the best stories? Jimmy Driftwood could tell you the best old time story of anybody I know of. And the best songwriter, and I’m assuming that Eddy [Arnold] wrote some of the songs he recorded, “Each Minute Seems a Million Years” is the finest thing I’ve ever heard in the way of a love song. It doesn’t tell the story straight but it’s got a plea to it. Merle Travis is one we’ve talked about a lot. Yeah, Merle Travis, “16 Tons,” and “Dark as a Dungeon.” I played that [“Dark as a Dungeon”] on stage quite a few times (Sings chorus). Yeah, I never will forget that song. I thought about, I couldn’t live being down there. I’ve been in a cave, a cave that wasn’t very deep, and to be in that mine wayyy back a half-mile under the ground, that scared me, to think about it. This is going to surprise you. It was the theme song from [the movie] ‘Never on a Sunday’ (sings melody). You ever watched that movie? That was the first thing. He listened to it on the movie a couple of times and had started learning finger style guitar and all at once he was playing the devil out of it. *special thanks to W. Kent Bennett for additional editing and transcription.